Our friends over at Cadalog just recently announced the release of Podium 1.5 for Mac OS X. SU Podium is a photo-realistic rendering plug-in for Google SketchUp 6. 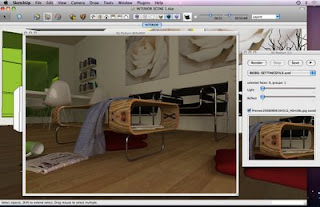 The Mac version of SU Podium is almost identical to the Windows version in features and performance and both provide one of the simplest ways to create beautiful photo-realistic images of SketchUp models. SU Podium 1.5 for the Mac runs on Mac OS X (Intel and PowerPC computers) and on both Leopard and Tiger systems. Download a free evaluation version of Podium 1.5 for the Mac (if you own a Windows license, the conversion is free). Google believes in supporting education. We're committed to providing students, educators and institutions with low-cost or no-cost software licenses and resources. We think that SketchUp has a place in every classroom, dorm room and student laptop in the world. After all – we live in 3D. Why shouldn't we start thinking and teaching that way? Si leis mi blog vereis que ya publiqué yo esta noticia. '3d for everyone' is just a lie at this point, no way around that. Just stop saying it. Please. You cannot get more disingenuous than that, it's not possible. "Google SketchUp is 3D for everyone"
Not for Linux, so please remove it. Linux supporters always cry about the same thing: "Not free for us!" Is Linux truly the free OS for everyone?...for a calculator, a dedicated AutoCAD workstation? It will certainly not work for those items, however it is, just as Google SketchUp is, free for everyone. As they state: "3D for everyone", not "3D for every OS". How funny to see the crowd that's always flying the: "Free software for the world & Open Source should be law", flag...quickly turn into the: "Down with FREE SketchUp, if it's not built for our Linux first then damn them!" You can please most people some of the time & you can please some people most of the time, but you will die trying to please a Linux user, even once. The Linux kvetching is getting tedious. I support changing the wording to "3D for everyone except Linux losers, because we don't like whiners". I'm one of the MILLIONS of people that DON'T use Linux...lol...I tried, but I guess I'm not as cool or as smart as you. Oh well...I get to use SketchUp though. People are afraid of things they can't understand. Some are afraid of Linux. Since the philosophy of Linux is freedom and open source, some companies stay away from Linux. In Sketchup, the "freedom" bit is the bait. You have buy the pro version. Fair enough! THERE WAS A LOT OF WORK PUT INTO IT. Maybe some of the so called "Linux users" should understand that freedom does not mean "for free". Still, Google will follow the example of Skype: at least make it available and keep the source secret. They would gain a lot of smart supporters and also some wannabe smart. The reality is that Sketchup DOES WORK on Linux (under Wine). Just "Google" it. Coming back to the subject, Podium looks very nice. Congratulations!